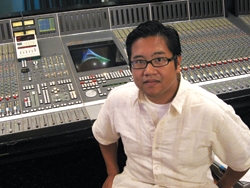 Marc Lacuesta '95 has crafted a career in Nashville's competitive music industry with talent, a good singing voice, and experience in the studio--although sometimes he needs help from a good roll of duct tape. On most days, Lacuesta's job is behind a sound board, as a recording engineer and, more recently, a music producer. But he has also done some arranging, programming, and vocal backup for top stars, including the country duo Big and Rich. "Music is all I do. But I do many things in music," he explains. Hard work and multiple talents have already brought Lacuesta success in a notoriously tough business. He's learned by experience that a Nashville career grows from gig to gig. "The music industry is built on relationships," he says. "The people you work with at the beginning of your career have the opportunity to help you all along the way." Lacuesta moved to Nashville in 1998, after receiving a BFA in music from the Berklee College of Music in Boston. He started his career as an intern, learning about the engineering side of the business. After the internship, he got a full-time job at another studio where he built his reputation and made enough contacts that he was able to strike out on his own in 2001. Lacuesta has worked in a variety of genres, from country to gospel to rap. One of his proudest accomplishments came working as recording engineer for gospel artist Shirley Caesar's album You Can Make It, which won the 2000 Grammy award for best traditional soul gospel album. Most recently, Lacuesta has started dabbling in songwriting, penning tunes that he hopes will interest some up-and-coming singer. "The whole music publishing business is like fishing. You put your songs out there as bait and hope someone bites. The more songs you have out there, the more likely someone will bite. That's where I'm at now." Working with so many different types of artists has taught Lacuesta to be flexible and think quickly on his feet. Take, for instance, the time he was tapped to help record portions of the video game 50 Cent: Bulletproof. Lacuesta's job was to record some of the voices of rap artists who appear in the video game. "A lot of the rap artists don't like to take their jewelry off--and they wear a lot of jewelry," he says. The problem is that the bling makes a lot of jangling noises during recording. Lacuesta's solution? Use duct tape to stick the jewelry to their bodies. "Problem solved," he says with a laugh. But of all the impressive artists Lacuesta has worked with, one stands out in his mind: Kenyon president Georgia Nugent. In fact, her name appears on his Web site in his list of top recording credits. "She might be the biggest celebrity I ever worked with," he says, chuckling. Lacuesta explains that some contributors to the Kenyon Fund used to receive lectures on CD as gifts. He heard one, and thought the sound quality could be better, so he offered his services. "I set up in a room in Peirce Hall and brought all my gear, so we had a makeshift studio. President Nugent did a great job and we ended up with a very good CD." Lacuesta majored in biology at Kenyon, because he was thinking about a career in medicine. But while his head was deep into biology, his heart--and voice--were all about the music. He joined the Kokosingers, Kenyon's all-male a cappella group, as well as the Kenyon College Chamber Singers. Those experiences helped propel him into his music career, he says. Even today, Lacuesta carries his passion for Kenyon proudly. He often wears a Kenyon shirt when he gets his photo taken with famous artists he works with, in the hopes that the photos will appear in the music trade journals. He also makes it a point to stay in touch with local Kenyon grads, and offer internships to Kenyon students interested in a career in the music industry. But while he is helpful, he doesn't want to be too encouraging to people whose interest in music is only half-hearted. "If you really can't picture yourself doing anything else but music, then by all means go for it. But it is something you really have to be committed to do."